ANOTHER Newsletter full of news of past events and future possibilities - and this time, with contributions from some new people. More, please! We mentioned in the last Newsletter that some work could be starting on the pathway through the woodland in Manor Woods. That hasn't happened, though the relevant City Council officers are still trying to bring it about before long. What will be happening soon is some overdue work to thin parts of the woodland near Brookview Walk. This is relatively new growth and not part of the ancient woodland closer to the Library end and it hasn't been maintained for many years. Thinning will allow more light in to encourage growth on the woodland floor. Don't be worried if you see some trees being cut down in the autumn - it's part of an agreed plan to maintain the long-term health of the woodland. Another, totally different, sort of long-term plan concerns roads. Remember the Ring Road? The proposal - supported by some, opposed by others - to build from the Cater Road roundabout westwards over Highridge Common to the A38 and on to the A370 is now bound up in a larger study of possible road schemes throughout the former Avon area. Called the Greater Bristol Strategic Transport Study (www.gbsts.com), this has now reached the point of an initial public consultation, and forms should be available in libraries and elsewhere. It sometimes seems as though the process of appointing consultants - doing studies - public consultation - reporting back - referring to other authorities is an end in itself, with no real outcome expected or desired. But one day it will actually lead to something, and we had better be prepared! ON the afternoon of Monday 12 July, Mavis (Palmer) and I, armed with two bags of books, made a pre-arranged visit to Headley Park Primary School. 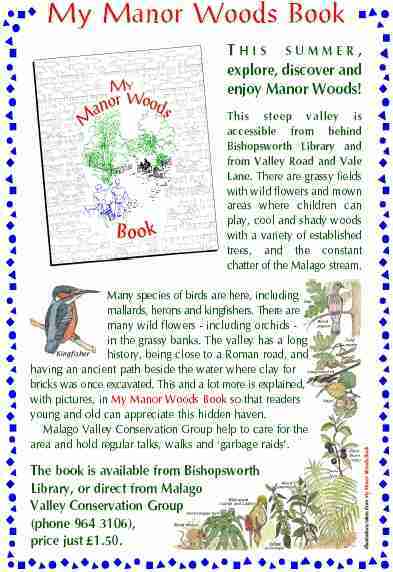 The aim was to interest the children and their mums and dads in our My Manor Woods Book and Walks on Dundry Hill in time for the school holidays to help them discover the outdoor areas on their doorstep. We set up our picnic table in the playground just before the children were due to go home so that everyone collecting could see what we were about. A few gusts of wind blew everything everywhere, but we managed to sell nine My Manor Woods Books and four Walks on Dundry Hill in about an hour, and hopefully sowed some seeds! Quite a worthwhile afternoon really. By way of a 'thank you' to the School, we shall be contributing a book to the new library which they are building. WE REPORTED in the last Newsletter that the planning application at THE OLD VICARAGE, Bishopsworth, for two bungalows in the grounds had been revised and that we would probably go along with it provided there were no further attempts to build in the grounds. In fact, it went to the South & East Development Control Committee of Bristol City Council on 30 June and I made a statement emphasising the need to ensure that the landscaping works were done promptly and correctly. Cllr Peter Crispin kindly referred to M.V.C.G. as 'an august body whose views should be taken notice of', and, although our specific suggestion for tightening up conditions on the developer wasn't accepted, the message came through loud and clear, from us and from everyone else, that we all wanted to see work here done properly and then development cease. Permission was granted. Last time, I said that a smaller development at PENTIRE AVENUE from those previously submitted, with all the parking off-street, would probably now be acceptable. I was wrong; the application has been refused and we will have to wait and see what happens next. But the big news this time is the planning application for the new WITHYWOOD CENTRE on the site of the Youth Centre at Queens Road, Withywood. This application is from the South Bristol Church & Community Trust and is designed to replace Withywood Church in Four Acres and provide a centre which combines a church, meeting rooms, a café, a youth café and a replacement for the Amelia Nutt Health Centre, as well as lettable space which would generate an income to support the centre. We have reported progress on this scheme in past newsletters. The late Geoff Cargill spoke to our 2003 A.G.M. about it, and Rachel Schofield updated us at the last A.G.M. At that stage, work on a detailed design was proceeding, and one of the points Rachel wanted our feedback on was whether the 'barn' (actually former stables, and the old Scout HQ) should be kept. We felt that it should - as did the Malago Society - so we are sad to find that the plans which have now appeared show it demolished and the stone used to face a mock 'bell tower' for the new church. But our main disappointment is that the general architectural quality is so poor. We are being offered a very large three-storey building that resembles a 1960s factory. We regret having to oppose this application, since we agree with its aims, but it is simply not good enough and we shall oppose it vigorously. THIS ANNUAL EVENT took place earlier this year (12 June) to coincide with Rivers Awareness Fortnight. We had a good turnout and what was pleasing was that most decades up to seventy were represented! 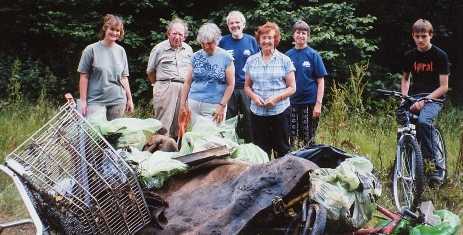 Everyone set to work with a will and we soon removed the usual interesting collection of artefacts from the Malago. 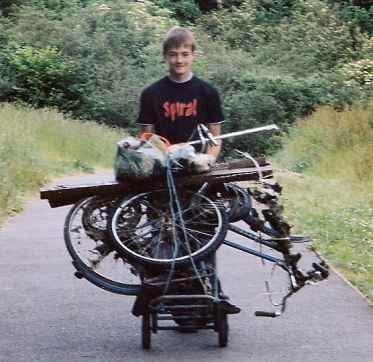 This year's haul included two broken bicycles, a trolley from B&Q, four baker's trays and a large piece of carpet as well as assorted builders' rubbish. Considering the oldest anti-pollution law in the country passed about five hundred years ago prohibited the dumping of solid waste in watercourses we don't seem to have progressed a great deal since. 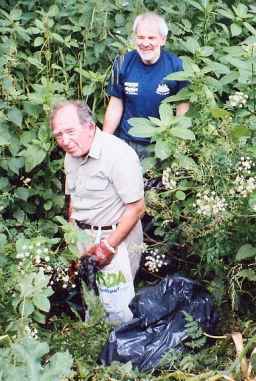 We also collected litter from the paths and bankside areas but they were very clear and the contractors who must have been there a day or two earlier should be praised. Sadly, when I walked along the cycle path on the following Thursday a lot more litter had been dropped particularly near the Library entrance. 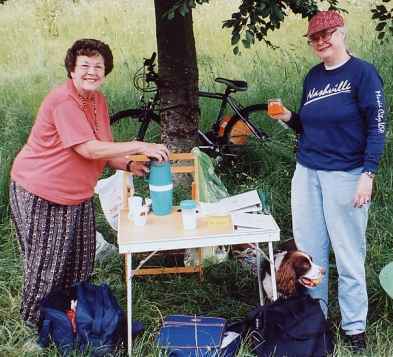 There was a welcome break for coffee supplied by Mavis Palmer which gave time for a little socialising. We also set up a stall to promote My Manor Woods Book manned by Marian Green, although no sales were made unfortunately. This year we were supported by the City's Clean and Green initiative who supplied litter pickers and bags and collected the accumulated rubbish on the following Monday. We finished with a photo shoot beside the pile and dispersed well satisfied with our morning's efforts. Thanks to Steve, Sarah, Marie Jo, André, Tony, Don, Mavis, Mavis, Marian, Matt, Mary, Anton, Lee, Lis and Jamie not forgetting Molly and Lily the dogs. See you all next year! OUR CLAIM to turn cans into daffodils - because we sell aluminium cans for recycling and spend the money on bulbs - could be joined by a claim to turn books back into trees. That's because there is now a way of recycling your unwanted books which will benefit M.V.C.G. 's funds and thus help us plant more trees in our area. The BookBarn in the Brislington trading estate (Bath Road) will take your second-hand books and sell them on, with a portion of the takings going to whichever organisation has set up an account with them. M.V.C.G. now have account number 9845, so if you quote that number then we will benefit. Alternatively, let any Committee member have your books or bring them to a meeting. 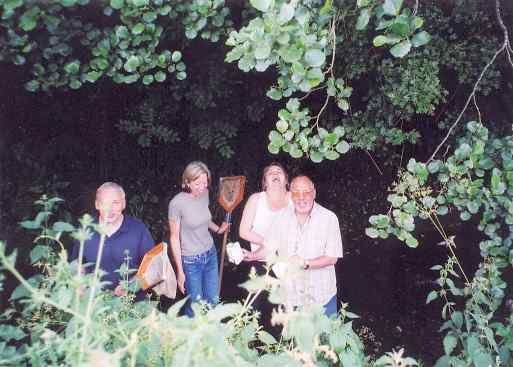 ON SATURDAY 12 JUNE, four intrepid explorers from the Southville Wildlife Group waded up the Manor Woods section of the Malago. We went to check on the stream's condition, and we were pleasantly surprised. The water was clear and it contained plenty of aquatic life indicating the water to be of good quality. In one short stretch of water we found freshwater shrimps, water lice, freshwater crustacea, stonefly and mayfly nymphs, and caddisfly larvae. And then in a pool we found scores of stickleback fish darting in all directions! It's good to know the Malago is alive and well, at least along one stretch of its journey to the River Avon. WHILST OUT on my early Sunday morning walk with my dog, I came upon a terrible sight. The Millennium Green in Hartcliffe is littered with needles! Terrified at the thought of a child picking them up on their way to school, I rushed home to call the Council's RAPID CLEAN UP TEAM. However, I was disgusted to find that the so-called rapid team took the weekends off, and all I got was a recorded message. Our children are at risk as long as needles are left where they can get them, and I feel this is not good enough! What is the use of a rapid response team that are not available when they are needed? Maybe the members of M.V.C.G. could get together and work towards getting the Council to make their rapid clean up team a 24-hour operation, and save our beautiful land from the dangers of drug paraphernalia. DESPITE the heat as this is written, the Programme Group is planning ahead to autumn. Our 'winter' series of meetings starts in October on the usual third Tuesday of the month (except November), meeting at St Peter's Rooms (by the side of St Peter's Church, Bishopsworth). Monday 23 August: Garbage Raid in Manor Woods at 3.45pm. Meet at the entrance to Manor Woods behind Bishopsworth Library. Monday 27 September: Garbage Raid in Kings Head Park at 3.45pm. Meet at the Sandburrows Road entrance to the Park. Tuesday 19 October: Spacemakers, a talk by MARK ROONEY about this innovative scheme to involve young people in improving our environment. 7.30pm at St Peter's Rooms. Tuesday 16 November: The silly and super Bishopsworth Quiz: more information next time. THURSDAY 18 November (note the change of day to avoid clashing with the Quiz): LES DAVIES, Warden of the Mendip Hills Area of Outstanding Natural Beauty will talk about his work. 7.30pm at St Peter's Rooms. 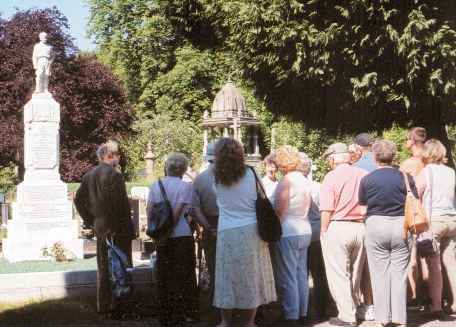 The joint visit with HHEAG to Arnos Vale Cemetery on 15 June was a great success and enjoyed by all who came. We hope to have a talk about Arnos Vale in due course. 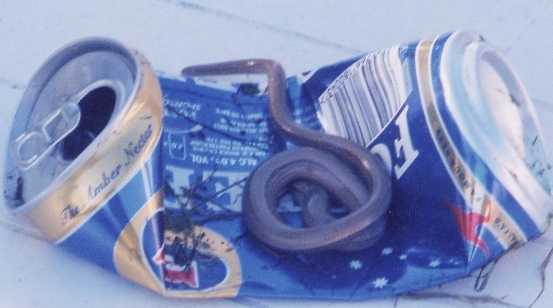 We found this slow worm in a bag of cans after our garbage raid in Withywood Park. Did it develop a taste for beer? (They usually eat slugs and insects). After its photo was taken, it was released in the long grass in our garden.